During her studies in psychology, Cathrin Spatt focused on personality development and specialized in psychosocial competence in business. After several years of professional experience in the field of psychiatry, her career led into the economy, primarily in consulting and supporting national and international clients. 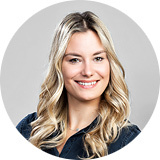 As an HR enthusiast, she is responsible for the business-oriented strategic direction of the appreciative people management of Iventa Group Holding GmbH and acts as a sparring partner for the management board and the employees themselves.